Great Lakes has been turning civilians into Seamen and Seamen into Sailors for more than 90 years. 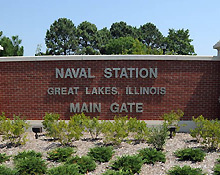 From its founding in 1911, Great Lakes has maintained its position as the Navy's largest training facility. Since World War I through today, it has trained and sent to the Fleet more than two million new Sailors through the Recruit Training Command, and nearly an equal number from its technical schools. It's the largest military installation in Illinois and the largest training center in the Navy.